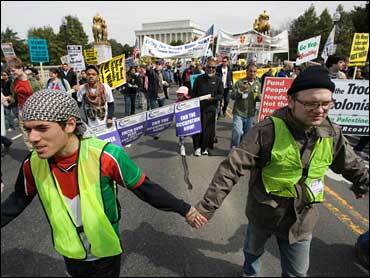 Arlington County, Virginia, authorities estimated there were 2,500 to 3,000 protesters. Organizers from the ANSWER Coalition said more than 1,000 groups sponsored the protest to call for an end to the Iraq war. Carrying signs saying "We need jobs and schools, not war" and "Indict Bush," demonstrators beat drums and played trumpets as they marched from near the Lincoln Memorial past the Pentagon into Virginia. Meanwhile, at a similar protest in San Francisco, tension grew after four or five dozen activists surrounded a group of riot-equipped police, throwing sticks and water bottles. Police responded by regrouping in riot formation and physically detaining several protesters who pushed and shoved with officers. Protest leaders shouted from the stage, urging police to leave. Barriers were quickly erected between police and protesters as an organizer urged calm and the activists started to disperse. In Washington, protesters demanded that President Barack Obama immediately withdraw all U.S. troops from Iraq, saying thousands of Iraqis have died and thousands of American troops have been wounded or killed. Anti-war activists said even though former President George W. Bush is out of power, they are disappointed with what they see as stalled action from Obama. "Obama seems to be led somewhat by the bureaucracies. I want him to follow up on his promise to end the war," said 66-year-old Perry Parks of Rockingham, North Carolina, who said he served in the Army for nearly 30 years, including in Vietnam. In southern California, hundreds of protesters gathered in Hollywood. Among them were peace advocate Cindy Sheehan - whose son was killed in Iraq - Oscar-winning screenwriter Paul Haggis and Ron Kovic, a paralyzed Vietnam veteran whose story was chronicled in the book and film "Born on the Fourth of July." Protesters in Los Angeles were expected to follow a rally with a march and then a symbolic "die in" where they would lie down in a major Hollywood Boulevard intersection to symbolize the soldiers who have died in the war. Protesters waved signs and sold bumper stickers and T-shirts commemorating the event. Denise Clendenning, 51, an environmental scientist from Chino Hills, California, said she hopes Obama will rethink his strategy to withdraw most of the troops from Iraq and Afghanistan and call all of them back instead. "We all have a lot of confidence in him," she said, holding two signs that read "Out of Iraq" and "End the War." In Washington, U.S. Park Police said no arrests were made. However, there sometimes was commotion among activists. This year, the protest in Washington was held on a weekend - a few days after the March 19 anniversary of the war, which began in 2003. Last year's weekday protest was marked by lower turnout than in previous years.